The “shakedown” cruise of 2015 actually went fairly well. Compared to most years, this one was quite low key. I remember last year when we left Souris and rounded the corner at Cape Bear, everything went crazy – lots of wind from several directions and big waves. This year was much better. We intended to leave at 5:00 but by the time we got organized and the fog has dissipated, it was 6:30. We left in the rain but there was very little wind. That was good because we had to keep our eyes peeled the entire day! We were on the lookout for lobster traps and knew that if one wrapped around the prop, it would be very bad news. We managed to miss them all but our track was probably not a very impressive straight line. At one point, when Dennis was having a nap and I was in charge, I spotted a whole bunch of lobster pot markers and veered off course. The markers suddenly flew up into sky. Humph! 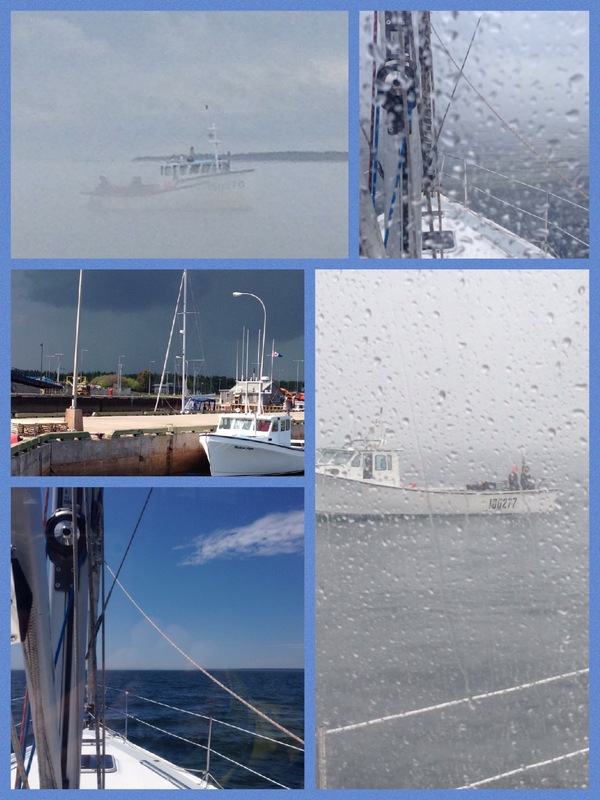 The weather was a typical Maritime day – rain, fog, wind, sun, more rain and then more sun. Most of our time on the water today was rainy but it did clear up at around 1:00 and became a beautiful day. The highlight of the day was when a little porpoise came alongside the boat and started swimming beside us. He then went in front of the boat and swam right in front of the bow for a good five minutes. It was really interesting to watch him dive and come right back up in front of the boat. Once we arrived at Wood Islands, we immediately went over to Crabby’s and learned that it was NOT open and that it had changed hands. The new owners will open up in July so we will see if they were able to get the lobster roll recipe from Crabby as it was awesome! Not much else happened today. All is good – we will be heading to Summerside tomorrow but it will be a long day on the water. North wind so it should be good for sailing. We will have to keep our eye on the lobster pots again. Here is an older post of the 2012 Shakedown Cruise. I was on the wharf, the day you splashed Split Crow. I was standing by the green shipping container watching it go in. Nice boat. hope you had a great sail thru the strait cheers!!! !